Degenerative spine problems can happen when you grow older. 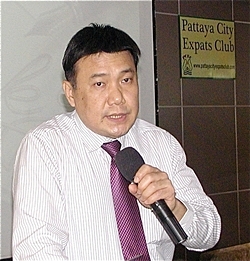 This was the topic at the February 19 meeting of the Pattaya City Expats Club. Phyathai Sriracha Hospital International Executive Gavin Waddell announced that a nurse was set up in the back alcove to provide free blood pressure checks and then introduced Dr. Montien Sirisuntornlak, M.D. to speak about degenerative spine cascade, which is the process by which the human spine changes and degenerates over time. It is a continuous process that can begin at any age and often takes 40-50 years or more to run its course and will affect 90% of the population to some degree during their lifetime. With diagrams and pictures, including pictures from MRI scans, Dr. Montien described the causes, symptoms, and treatment for this condition; also known as spinal stenosis. This is a narrowing of the spinal column that causes pressure on the spinal cord, or narrowing of the openings where spinal nerves leave the spinal column. Initially, he said, there may be no symptoms. When symptoms do occur, they often start gradually and worsen over time. The most common parts of the spine affected are the neck and lower back. Symptoms vary, depending on the location. Dr. Montien Sirisuntornlak, M.D., of Phyathai Sriracha Hospital, speaks about degenerative spine cascade, the process by which the human spine changes and degenerates over time. If it is spinal stenosis in the neck, symptoms will be numbness or weakness or tingling in a leg, foot, arm or hand. You may drop things more often or have a tendency to fall. You can also feel neck or shoulder pain. In severe cases, nerves to the bladder or bowel may be affected, leading to incontinence. Compressed nerves in your lower (lumbar) spine can cause pain or cramping in your legs when you stand for long periods of time or when you walk. The discomfort usually eases when you bend forward or sit down. There are many different types of problems that can reduce the amount of space within the spinal canal. The most common of these problems are related to degeneration and the aging process. He described the age related causes, which can be osteoarthritis, disk degeneration, or thickened ligaments. Other causes are Paget’s disease of the bone, achondroplasia (congenital), spinal tumors, and spinal injuries. Dr. Montien then explained the diagnostic tests that can be performed. These include x-ray, CT scan, and MRI scan with the MRI being the test of choice. Risk factors are primarily age or inherited conditions. Treatment most likely will start with medications such as antidepressants to ease pain, anti-seizure drugs to reduce pain caused by damaged nerves, and opioids. Physical therapy may also help. Also, your nerve roots may become irritated and swollen at the spots where they are being pinched. In such cases, injecting a corticosteroid into the space around that constriction can help reduce the inflammation and relieve some of the pressure. PCEC Board Member David Meador updates fellow members and guests on upcoming events in Pattaya and the ‘Land of Smiles’. Dr. Montien said that surgery may be considered if more conservative treatments haven’t helped, you are disabled by your symptoms and you are in otherwise good health. However, he pointed out that spinal surgery is complicated and strongly recommended that you seek out a second opinion if your doctor is recommending surgery. He also mentioned that there are some lifestyle and home remedies that can be done to alleviate the symptoms. For cervical (neck) stenosis, you can apply heat or cold packs to the neck and to take great care in avoiding injuries to your head and neck as they can worsen your symptoms. For lumbar stenosis, you can use canes or walkers as they provide stability and can also help relieve pain by allowing you to bend forward while walking. Also, losing excess weight can help because extra weight puts additional stress on joints and bones, particularly the lower back. 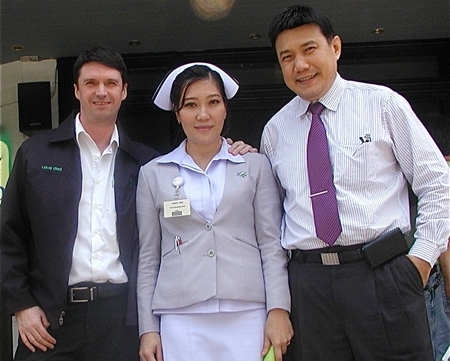 Phyathai Sriracha Hospital International Executive Gavin Waddell (left), Dr. Montien Sirisuntornlak, M.D. (right) and Nurse Wanvisa pose for a photo following Dr Montien’s very interesting presentation. 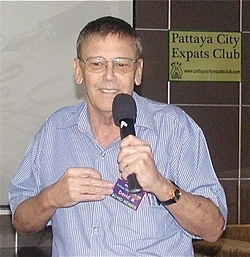 After Dr. Montien answered several questions, Master of Ceremonies Richard Silverberg called on Al Serrato to conduct the always informative Open Forum where questions are answered about expat living in Thailand, recommendations made about movies and restaurants, and occasionally the telling of a joke or two. The Pattaya City Expats Club meets every Sunday at the Amari Orchid’s Tavern by the Sea Restaurant. Read more about the Club’s activities on their website at www.pattayacityexpatsclub.com.